Myo Ji Sunim had a massive brain hemorrhage yesterday late afternoon and was brought to St. Luke’s Hospital after having been found by a student. She is now in the ICU on life support, waiting for her family to arrive. She is not responsive now. 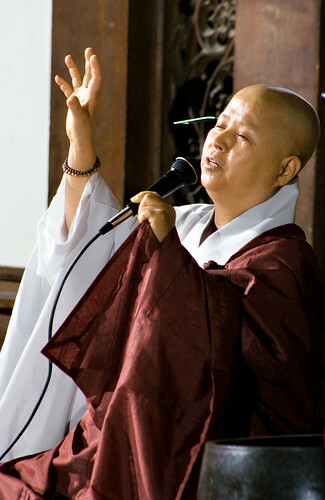 Much of her Sangha was there as well. UPDATE: Myoji died at 4pm this afternoon, Friday November 4. Her energy and competence at organizing all the different sanghas of the Buddhist Council—Tibetans, Sri Lankans, Koreans, Chinese, Japanese, Americans—was awesome. This spring, when the Council was debating whether we had time to organize a Buddha’s Birthday celebration, Myoji interrupted to say she’d raised all the money we’d need and she’d reserved Union Square. Without any drama, she always seemed capable of running circles around the rest of us. Myoji Sunim, a bald, preternaturally extroverted Korean monk, opened the door and prattled happily with me for a half-hour over tea…. “Who are you?” she asked. I stared blankly. She tried again. I guessed, “Arianne?” She shook her head. “It’s okay. After practice long time, one day you tell me.” She put a bell in front of me. “What is this?” “A bell?” She shook her head. “It’s empty. That Zen.” She rang a different bell, bowed, and gestured for me to leave.